EverytingPre has a rather interesting, under the radar story up about one of the very first hands-on Pre reports from an actual user. 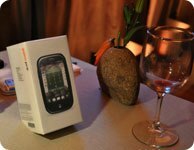 EverythingPre forum member Artap99 claims to have access to a Pre for a short time via a friend who does "online electronic product reviews" and let him play with the device for approximately one hour. Whether or not the Pre in question was final production hardware and/or OS is uncertain. Over the course of 11 pages in the EverythingPre forums, Artap99 addresses some questions and concerns from users while posting additional details about the device though posting no substantially detailed or new info such as what was revealed last week by the InsideSprintNow blog. Many EverythingPre forum members have expressed serious doubts about the validity of the information provided by Artap99 due to its vagueness. However, Everything Pre site Admin Christopher Meinck has reiterated his support for the poster's authenticity, thus our determination of the story as news-worthy. Build quality is described as "noticeably plasticky". However, it was reassuring to read that Artap99 feels the Touchstone replacement battery cover would add an improved tactile feel to the Pre. Artap99 was disappointed by the Pre's keyboard. Not only was the feel of the Centro-style gel keyboard described as having "slow" travel and being crowded for his thumbs, he also lamented the lack of an onscreen keyboard. The Pre's weight is described as being "good" and not too bulky. Performance-wise, the Pre is described as not being fantastic "…but it is iPhone grade. Things take time to open. Transitions aren't always immediate." The multitasking aspect of WebOS is described as having "…no noticeable slowdown with more applications open. Everything performs very well." Battery life is described as "…good. Definitely on par with a Treo so far". Camera image quality is described as better than the Samsung Instinct and the "colors were accurate and crisp". The LED flash is described as "great" and bright enough to potentially be used as a flashlight should someone create such an app in the future. >>># Artap99 was disappointed by the Pre's keyboard. Not only was the feel of the Centro-style gel keyboard described as having "slow" travel and being crowded for his thumbs, he also lamented the lack of an onscreen keyboard. Eh. A dev will create an OSK. But I hope the physical one isn't outright terrible! # Performance-wise, the Pre is described as not being fantastic "…but it is iPhone grade. Things take time to open. Transitions aren't always immediate." I'm hoping this is still not 100% optimized code. I'm worried about the opposite. From what we saw at CES (and what Ryan again saw at CTIA) the Pre was very speedy & responsive, with near-instantenous card switching while multitasking. But analogous to a Windows install that gets cluttered up with all kinds of crud and loose .DLLs etc., I am worried that as the Pre's ROM gets closer to production-ready and more apps/services/fluff gets added to it, things are starting to get bogged down. At any rate, performance is the LEAST of my worries for WebOS & the Pre. It has a powerhouse chipset & processor and things can only get better *IF* Palm cares enough to tweak & optimize. I mean, OS 5 Garnet devices appeared in late '04 and it took basically a year for the first decent-performing Garnet PDA (TX) to appear and three years for the first snappy Garnet smartphone (Centro) to arrive. Wouldn't it be nice to have the option within WebOS to turn off the transitions & UI fluff in order to possibly save battery power and speed up performance? the first snappy Garnet smartphone (Centro) to arrive. Battery life is described as "good. Definitely on par with a Treo so far". And this is determined in a one hour test? Probably "determined" in a one hour test that used a Pre in standalone mode (no Synergy et al accessing WebOS servers, for example). The one thing I am finding mystifying in all of the various Pre reports and comments is not a single peep about how well it performs as a PHONE--reception, speaker clarity/volume, the phone app itself. Am I just a curmudgeon or do people do very little talking nowadays on their smartphones?